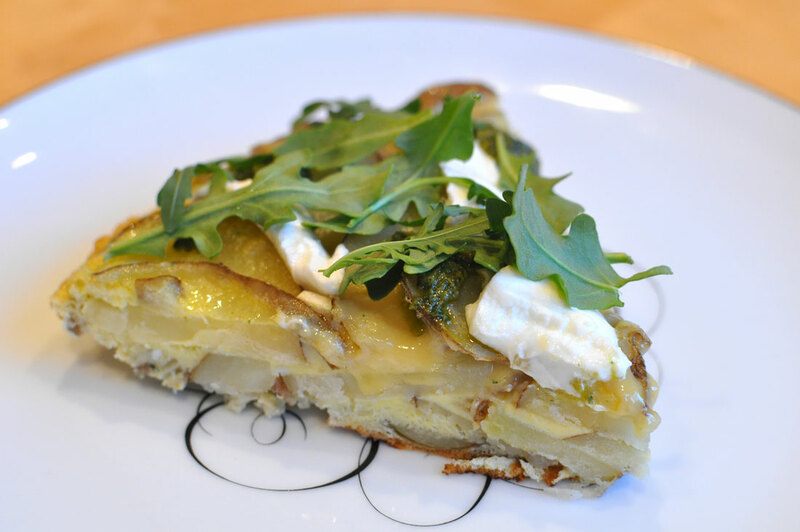 Here is an easy frittata recipe that is good for any meal. Olive oil (instead of butter) and goats cheese (flavorful, so you don’t need as much) make this one nice for those who are looking for a healthier version. The total preparation and cooking time usually takes around 30 to 35 minutes. You can also serve this dish with fresh basil and tomatoes on the side. Put the sliced potatoes in a large saucepan filled with salted water then boil them for five minutes. Pre-heat the oven to 450 degrees (220 degrees Celsius). Combine the eggs and garlic in a large bowl and season with salt and pepper. Drain the sliced potatoes then add to the egg mixture. Heat the olive oil in an oven-safe skillet. Pour the potato and egg mixture into the pan then cook for five minutes or until 2/3 of the frittata gets firm. Remove the skillet from heat then put in the oven and bake for 10 to 15 minutes. Remove the frittata from the oven then top with some slices of goat cheese, pesto, and arugula. Slice the frittata like a pizza and serve warm.